One of my most viewed posts on Sandwichtalk is my review of the Subway Seafood Sensation. This is due in no small part to the back and forth in the comments on whether or not their seafood salad contains real crab. (Pro Tip: if you have a shellfish allergy, you probably should check with the staff of the restaurant before trying anything which could potentially contain shellfish.) So when I heard that competitor (and better, in my opinion) Quiznos was offering a seafood salad, I had to give it a try. And make no mistake: this blend most certainly contains lobster. "Dr. Jones. Again we see there is nothing you can possess which I cannot take away. " 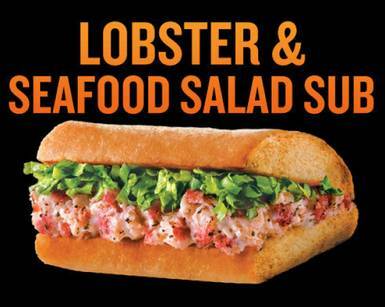 The Lobster & Seafood Salad Sub is pretty simple. As a default, it comes with the seafood blend and lettuce. The presence of lobster in the salad does give it a nice authenticity and texture, but the finer shredding of the meat means you get a little bit less for your money than at Subway. The sub seemed to be missing something, so halfway through I added Quiznos’ horseradish sauce. It was exactly what the sub needed, I’d highly recommend you do the same. The regular Lobster & Seafood Salad Sub retails for a bit more than $5, so it’s a little hard to justify over Subway. However, if you’re in the mood for genuine lobster salad and don’t mind paying for it, this is the sub for you. Subway’s Seafood Sensation seems to be a regional choice and the Subway’s in Southern California haven’t had it in a couple of years. Adding bacon to the Lobster sub is a great idea too! I tried it yesterday and I thought it was so much better than Subway’s seafood salad (but I do like that one, too). I got it on a wrap and it was very good! Are you kidding me?! If I were to guess the ratio of lobster to IMMITATION seafood in Quinos’ salad I’d say it’s 2%/98%. I was greatly disappointed as I hate imitation seafood. Thier ads on tv and in print are mouthwatering as they highlite the meat of a lobster claw. It should rightly be called SEAFOOD & (an iota of) lobster Salad. I’ve never tried Subway’s and don’t plan to. I’ll stick to the fish markets in the future. Eating this sandwich as I type. I find it hard to believe that anybody who eats real lobster will mistake this as tasting like lobster. It tastes like a canned medley of mystery, supposed to taste like seafood, imitation congealed parts. Does that make it awful? Matter of personal opinion. Calling this a lobster sandwich is like calling my shoes prime rib.